There is currently a bill in the US House to make English the official language of the United States. These bills have been around for a while now. H.R. 997, also known as the “The English Language Unity Act”, was first proposed in 2003. The companion bill, last seen as S. 678 in the 114th congress, was first introduced to the Senate as S. 991 in 2009, and if history is any guide will be introduced again this session. So if these bills have been around for a bit, why am I just talking about them now? Two reasons. First, I had a really good conversation about this with someone on Twitter the other day and I thought it would be useful to discuss this in more depth. Second, I’ve been seeing some claims that President Trump made English the official language of the U.S. (he didn’t), so I thought it would be timely to discuss why I think that’s such a bad idea. As both a linguist and a citizen, I do not think that English should be the official language of the United States. Historically, language legislation at a national level has… not gone well for other countries. Picking one official language ignores the historical and current linguistic diversity of the United States. Let’s start with how passing legislation making one or more languages official has gone for other countries. I’m going to stick with just two, Canada and Belgium, but please feel free to discuss others in the comments. Unlike the US, Canada does have an official language. In fact, thanks to a 1969 law, they have two: English and French. If you’ve ever been to Canada, you know that road signs are all in both English and French. This law was passed in the wake of turmoil in Quebec sparked by a Montreal school board’s decision to teach all first grade classes in French, much to the displeasure of the English-speaking residents of St. Leonard. Quebec later passed Bill 101 in 1977, making French the only official language of the province. One commenter on this article by the Canadian Broadcasting Corporation called this “the most divisive law in Canadian history”. Language legislation and its enforcement in Canada has been particularity problematic for businesses. On one occasion, an Italian restaurant faced an investigation for using the word “pasta” on thier menu, instead of the French “pâtes”. Multiple retailers have faced prosecution at the hands of the Office Québécois de la langue Française for failing to have retail websites available in both English and French. A Montreal boutique narrowly avoided a large fine for making Facebook posts only in English. There’s even an official list of English words that Quebec Francophones aren’t supposed to use. While I certainly support bilingualism, personally I would be less than happy to see the same level of government involvement in language use in the US. In addition, having only French and English as the official languages of Canada leave out a very important group: aboriginal language users. There are over 60 different indigenous languages used in Canada used by over 213 thousand speakers. And even those don’t make up the majority of languages spoken in Canada: there are over 200 different languages used in Canada and 20% of the population speaks neither English nor French at home. Another country with a very storied past in terms of language legislation is Belgium. The linguistic situation in Belgium is very complex (there’s a more in-depth discussion here), but the general gist is that there are three languages used in different parts of the country. Dutch is used in the north, French is the south, and German in parts of the east. There is also a deep cultural divide between these regions, which language legislation has long served as a proxy for. There have been no fewer than eight separate national laws passed restricting when and where each language can be used. In 1970, four distinct language regions were codified in the Belgium constitution. You can use whatever language you want in private but there are restrictions on what language you can use for government business, in court, in education and employment. While you might think that would put a rest to legislation on language, tensions have continued to be high. In 2013, for instance, the European Court of Justice overturned a Flemish law that contracts written in Flanders had to be in Dutch to be binding after a contractor working on an English contract was fired. Again, this represents a greater level of official involvement with language use than I’m personally comfortable with. I want to be clear: I don’t think multi-lingualism is a problem. As a linguist, I value every language and I also recognize that bilingualism offers significant cognitive benefits. My problem is with legislating which languages should be used in a multi-lingual situation; it tends to lead to avoidable strife. Ok, you might be thinking, but in the US we really are just an English-speaking country! We wouldn’t have that same problem here. Weeeeelllllll…. Languages of the United States, by speakers, based on data provided by the Modern Languages Association, which is in turn based on 2010 census data. 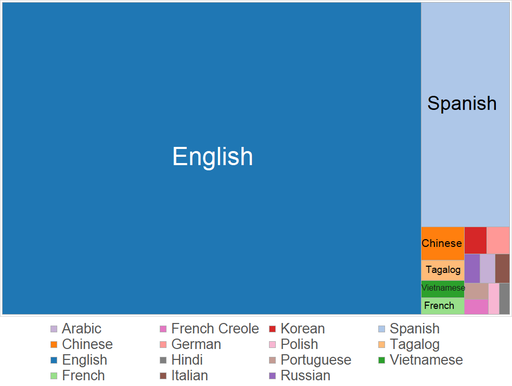 The number of different languages spoken in the US is also remarkable. In New York City alone there may be speakers of as many as 800 different languages, which would make it one of the most linguistically-diverse places in the world; like the Amazon rain-forest of languages. In King County, where I live now, there are over 170 different languages spoken, with the most common being Spanish, Chinese, Vietnamese and Amharic. And that linguistic diversity is reflected in the education system: there are almost 5 million students in the US Education system who are learning English, nearly 1 out of 10 students. Multilingualism in the United States is nothing new, either: it’s been a part of the American experience since long before there was an America. Of course, there continue to be many speakers of indigenous languages in the United States, including Hawaiian (keep in mind that Hawaii did not actually want to become a state). But even within just European languages, English has never had sole dominion. Spanish has been spoken in Florida since the 1500’s. At the time of the signing of the Deceleration of Independence, an estimated 10% of the citizens of the newly-founded US spoke German (although the idea that it almost became the official language of the US is a myth). New York city? Used to be called New Amsterdam, and Dutch was spoken there into the 1900’s. Even the troops fighting the revolutionary war were doing so in at least five languages. Making English the official language of the United States would ignore the rich linguistic history and the current linguistic diversity of this country. And, if other countries’ language legislation is any guide, would cause a lot of unnecessary fuss. Next ›What’s up with calling a woman “a female”? A look at the parts of speech of “male” and “female” on Twitter . Thank you for your insightful article; this is a topic I’ve been thinking about a lot lately. However, I’m curious how you reconcile your comments about King Country given that English is the official language of Washington state (and 27 other states). Thank you for your comment! I’ve been looking for more information on the official language of Washington state, and I can’t seem to find much. As far as I can tell, the current policy of that state is to embrace linguistic diversity (https://app.leg.wa.gov/rcw/default.aspx?cite=1.20.100). There was a house bill introduced in 2009 to make English the official langauge of the state (http://apps.leg.wa.gov/documents/billdocs/2009-10/Pdf/Bills/House%20Bills/1645.pdf) but as far as I can tell, it didn’t actually pass (http://leg.wa.gov/senate/committees/documents/reports/billspassed/2009.pdf). I’m a relatively recent transplant, though, so if you have more details I’d love to hear them! As for making languages official at the state level… Again, I’m not a fan of language legislation in general, but if it is going to happen, I do feel that more local (state, county or city) is preferable since smaller communities are more likely to be linguistically cohesive. Well, its an interesting paradox. We may in fact be well served as a collective by having a predominant language, but making one language the statutory language of the land would probably be destructive.